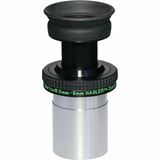 The 3-6mm Tele Vue Nagler Zoom Eyepiece is perfect for the serious lunar and planetary observer. 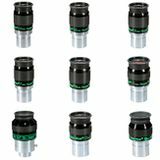 The apparent field and eye relief stay constant, and it is parfocal throughout the zoom range which eliminates the need to refocus as you adjust it. 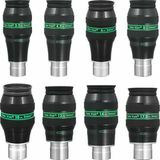 Tele Vue Panoptic telescope eyepieces set the standard for wide field optical performance. They are fully multi-coated and feature a sharp, high-contrast image across their 68anddeg; field of view. The optics are housed in an exquisitely crafted body. Tele Vue Nagler telescope eyepieces offer an 82-degree "spacewalk" view of the night sky. But a large field of view isn't all these eyepieces are known for. Their sharpness, contrast, and brightness are unparalleled in the industry. 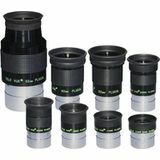 Tele Vue Plossl telescope eyepieces set the standard in this time-tested design. Fully multi-coated for the greatest light transmission and contrast, each Plossl features a beautifully machined housing. 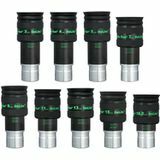 The Tele Vue Ethos line of telescope eyepieces provide a stunningly wide field of view combined with optical performance that is unmatched. Their 100-degree field of view (110-degree for the 3.7mm) provides expansive views of the cosmos. 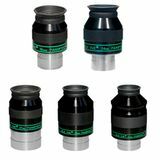 Tele Vue Delos telescope eyepieces offer 20mm eye relief and a wide, 72-degree apparent field-of-view with full field sharpness, virtually perfect theta distortion mapping, and color neutrality. An adjustable-height eyeguard helps enhance contrast. 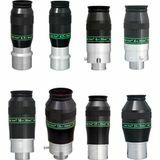 DeLite eyepieces from Tele Vue present a more lightweight and economical version of the popular Delos eyepiece series. Each DeLite eyepiece features a 62-degree apparent field of view, 20mm eye relief, and a unique, sliding and locking eyeguard.